It’s that time of year, when families and friends try to get together before the winter socks us in (sorry Buffalo, you’re already socked…). The Foodie Family celebrates birthdays, Thanksgiving, Christmas and New Year’s all in the matter of 6 weeks!! We are scattered around the globe this season but we try not to let that dampen our enthusiasm. If you can’t be near your family, then it’s time to gather friends! However, nobody wants to be stressed and rushed when the guests arrive. I like to be cooking when people are coming in the door. I think seeing the fresh ingredients and smelling the meal cooking enhance your appetite. That being said, I don’t want people to have grumbling tummies while they wait! So this is one of my “go to” appetizer plates. It’s easy to prepare ahead and adaptable to gluten-free, dairy-free, vegan, or whatever! Each guest creates their own perfect bite. The only things that required cooking on this platter are the caramelized onions and the mushrooms. To caramelize onions, splash some olive oil in a fry pan that is sized to allow the onions to spread in a layer about 2 slices thick. These will shrink and have more contact with the pan as they cook. Heat the olive oil at medium high heat. Add the sliced onions and turn the heat down to medium. Then flip, turn and toss until they are golden and very limp. This can take 10 to 15 minutes, take your time, it’s worth it! The mushrooms are just as easy. Heat the pan to high medium heat and keep it there throughout the cooking process. Melt butter and olive oil together in equal amounts, about 1 Tbsp total for 8 oz of mushrooms. When the oil mixture is hot, add the mushrooms. Again with the turning and tossing… When the mushrooms are golden and the juices are absorbed or bubbled off, add a generous splash of tamari sauce and continue cooking until this is absorbed and reduced into the mushrooms. They should not be dry, but not saucy either. You are done with the cooking! 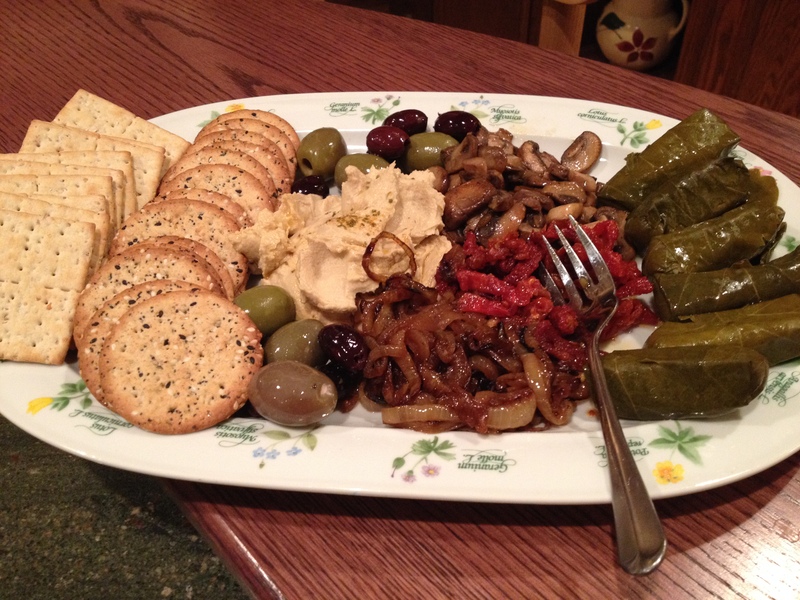 The platter is assembled with the prepared hummus, sun-dried tomatoes, olives, stuffed grape leaves and your own onions and mushrooms. Arrange these so the platter is pretty and enticing. You can even add some pretty herbs for garnish (if you have them left from your main course, I wouldn’t bother buying them special)! Serve with crackers, bread or crudite. Now your guests can nibble and keep you company while you finish preparing your main course. I like to have people stay near the kitchen with me so I serve this in the kitchen with before dinner drinks and everybody is happy to wait for dinner, and I can enlist help, if needed!